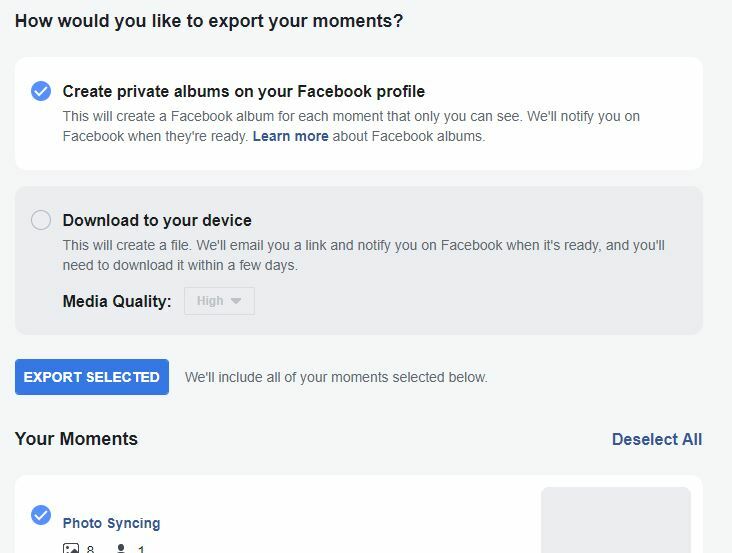 Facebook Moments which released in 2015, lets you share pictures with your Facebook friends that are stored on your phone without actually uploading the photos to the social network itself. The concept was similar to Google Photos, was for people to be able to easily swap group photos or vacation pictures more easily. Jon Doe, the Moments app will no longer be available after February 25. We know your photos are important, so we’ve made ways for you to export and keep them. 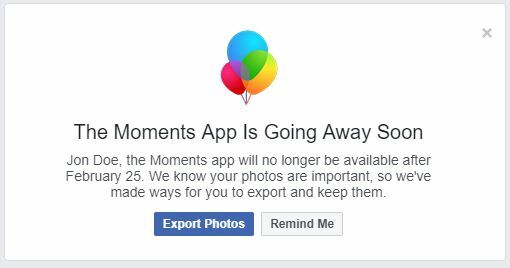 Facebook Moments has few more days before it will be closed , as stated that 25 February will be the last day of Facebook Moments. You can click the “Export Photos” link to proceed with the export procedure. Facebook shared that it’s shutting down the app because not many people are using it. Facebook declined to share user stats and usage. But a third-party, mobile analytics firm, said the app has been installed by 87 million users on Apple’s App Store and Google’s Play Store since the service was first launched. At its peak, the app was downloaded 10.7 million times in June 2016. That declined to about 150,000 downloads in December 2018. By default all your images will be selected under “Your Moments“. after some time you will be given a notification that “The album you created from Moments App is ready to view” while a new album will be visible with all your images, the privacy for the album will be set to Private so you do not have to worry if someone can view that. Once the images are ready for download you will be given a notification in your Facebook account and an email will also be sent to your primary email address, please note the Downloadable Export of Images will be available for only few days and to download the images you will need to enter your Facebook Password. I hope it clarifies any questions if you had in an already very simple procedure. Many of you might not even be knowing about Facebook Moments App for those who know can get their images and see if they ever had any images shared on that app. Did you know about Facebook Moments App before this date ? You ever used Facebook Moment App ?